The premise of the project is the 70% possibility that a magnitude 7.0 earthquake will occur in Tokyo in the next 30 years. 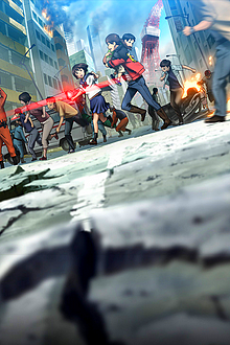 The anime depicts what would happen if an 8.0 earthquake took place. The story centers on Mirai, a middle school freshman girl who goes to Tokyo’s artificial Odaiba Island for a robot exhibition with her brother Yuuki at the start of summer vacation. A powerful tremor emanates from an ocean trench, the famed Tokyo Tower and Rainbow Bridge crumble and fall, and the landscape of Tokyo changes in an instant. With the help of a motorcycle delivery woman named Mari who they meet on Odaiba, Mirai and Yuuki strive to head back to their Setagaya home in western Tokyo.